The windows are listed initially visible first by title, then not visible by title. Clicking on a column label (Title, Name, Type, and Visible) causes the display to be ordered alphabetically by that column. Show: unhide the window (if necessary) and bring to the front. Hide: hide the window (so it is invisible; its state will be :shrunk). Close: close the window. Note that certain windows should not be closed since doing so would cause Lisp to exit. Note that for some windows (the Options dialog displayed by Tools | Options, for example), clicking the Close button hides them rather than closes them, to save the expense of recreating them if they are needed again. Destroy (the next option) closes a window for sure. Destroy: actually destroy the window (do not just hide it). Certain windows should not be destroyed since doing so would cause Lisp to exit. 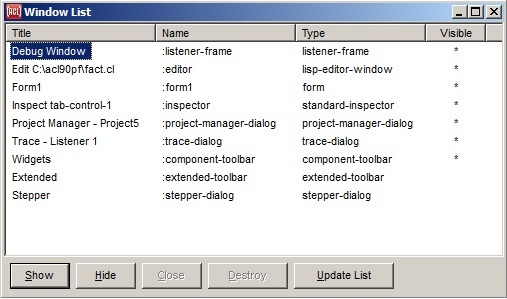 Destroying a system window (such as the Package List window) might be useful if you have modified the size or the appearance and want to revert to the original size or appearance. Destroyed windows are rebuilt according to their original specifications. Update List: update the display.